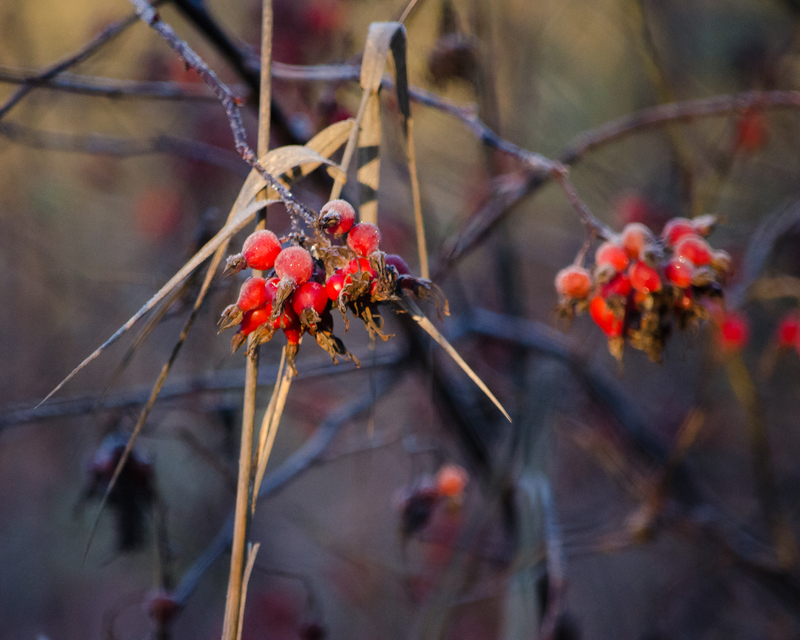 Being November, the morning of this particular outing was crisp and cold. It had been dry for a few days, and incredibly windy; my hope was to find a trail through a lovely, frost-covered landscape. Plus, of course, birds. Always birds. I decided to try my luck at revisiting a location which all but guarantees a great day of birding: Jackson Bottom Wetlands Preserve. Located in Hillsboro, it is bordered on the south by the Tualatin River and within its 635 acres contains a great selection of different habitats which draw all sorts of wildlife throughout the year. 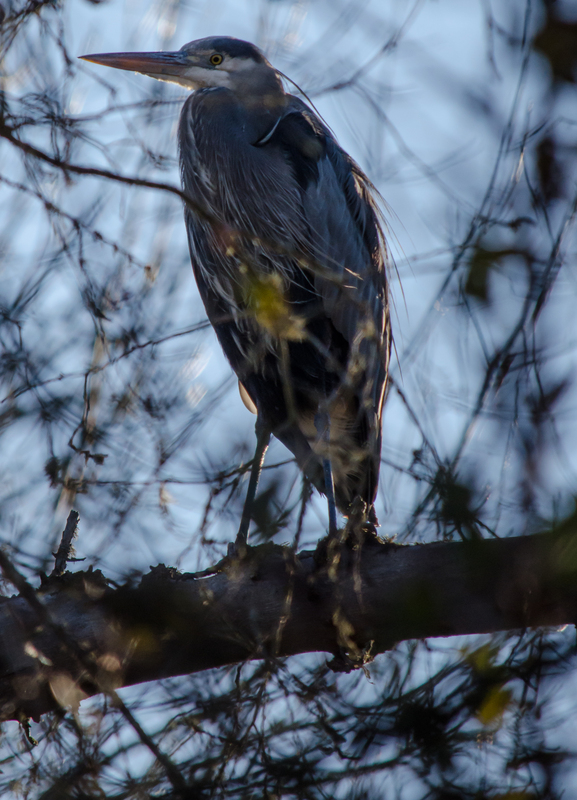 As I started my walk along a trail beside the Tualatin River, I could see a few ducks down in the water, including mallards, wood ducks, and hooded merganser; I also spied a great blue heron perched up in a tree. In truth, I stumbled upon him and was quite surprised he stayed long enough for me to get my camera to focus past the branches to capture his portrait. He seemed mildly curious, turning his eye towards me and watching for a few moments before taking flight with a deep, croaking call. As dry as the weather had been, I was not surprised to find that places which are submerged during other parts of the year were still quite dry. At the Kingfisher Marsh Viewing Shelter, I scanned the nearby grasses; the area seemed very quiet and I was expecting to find nothing but perhaps a couple of small songbirds checking for seeds. A bit of movement caught my eye, and using my camera to zoom in I spotted a female northern harrier working her way through breakfast. Bits of gray down were being pulled free and littered the ground around her; long, dark brown feathers identified the wing of her meal. I am guessing it may have been a cackling goose; there were plenty of them around, and the size seemed appropriate. After observing her for a time, I left her to her meal. Following the direction of a flock of northern pintails passing overhead, I made my way towards the Blue Heron Trail; in all of my previous visits, this was the one trail I had never managed to walk down as high water levels will make it impassible. The trail crosses a stream and then turns sort of northeast; open fields (at least this time of year) extend to the south and east side of the trail, with wetlands on the north and west sides extending back up into the preserve. 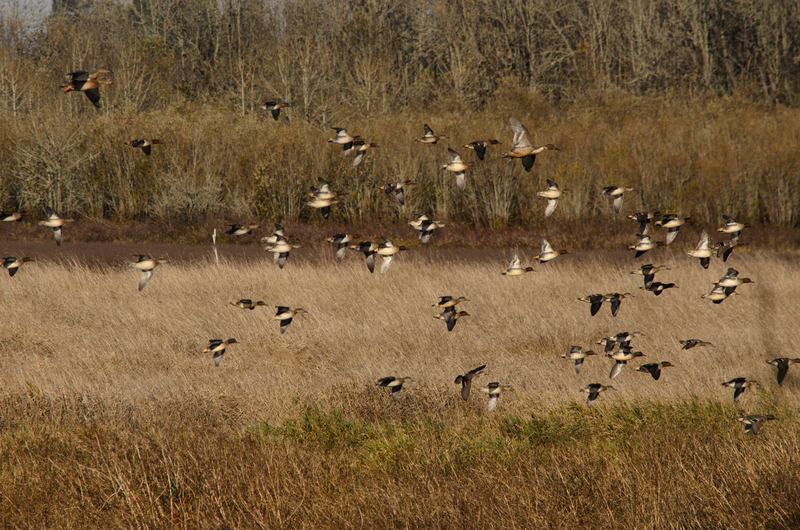 Dozens of ducks were in the wetlands, at times taking wing to move from one area to another in great mixed flocks. Green winged teals seemed to be the predominate species, although American wigeons, northern pintails and mallards were easily picked out among them as well. 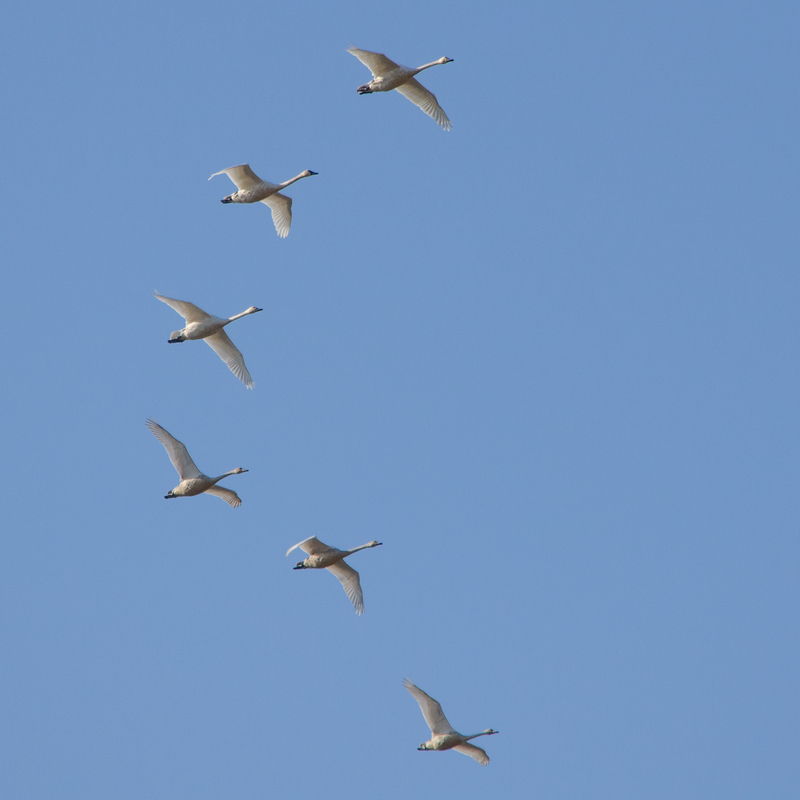 A flock of tundra swans passed by overhead, beautiful and quiet as they worked against the wind towards their destination. Towards the end, the trail leads into a stand of oaks with low, dense vegetation providing cover for smaller birds. 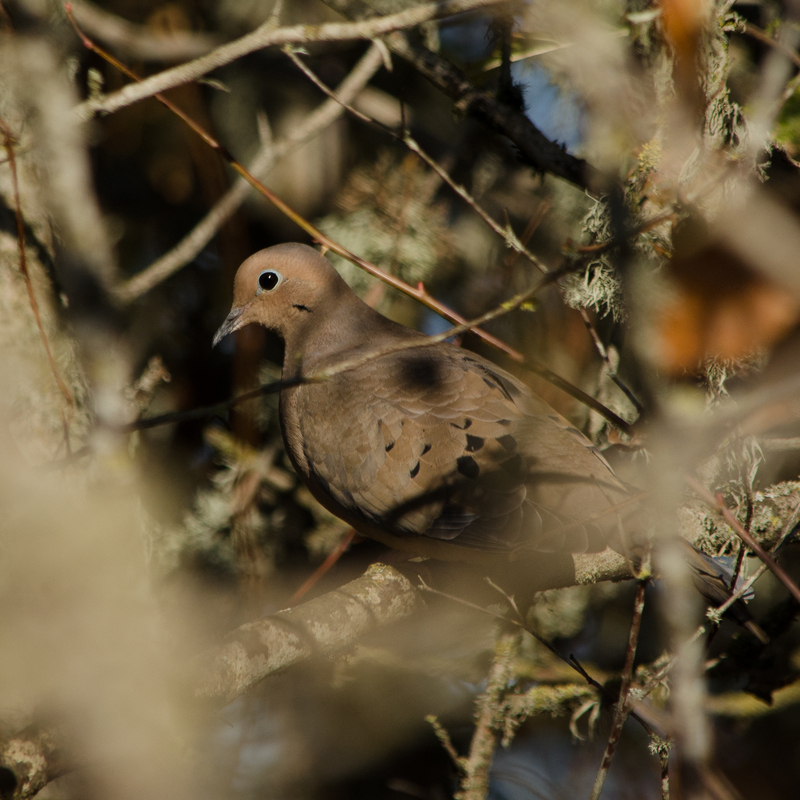 A pair of mourning doves possibly startled me more than I startled them when they burst out and then dove back into their sheltered perches. I heard something else in the dense blackberry bushes; it was familiar, but I could not quite place it. For a time, I crouched beside the bushes to listen (I’m sure that must have looked incredibly bizarre), and a chubby little shadow moved past an opening between the thorns. Quails! 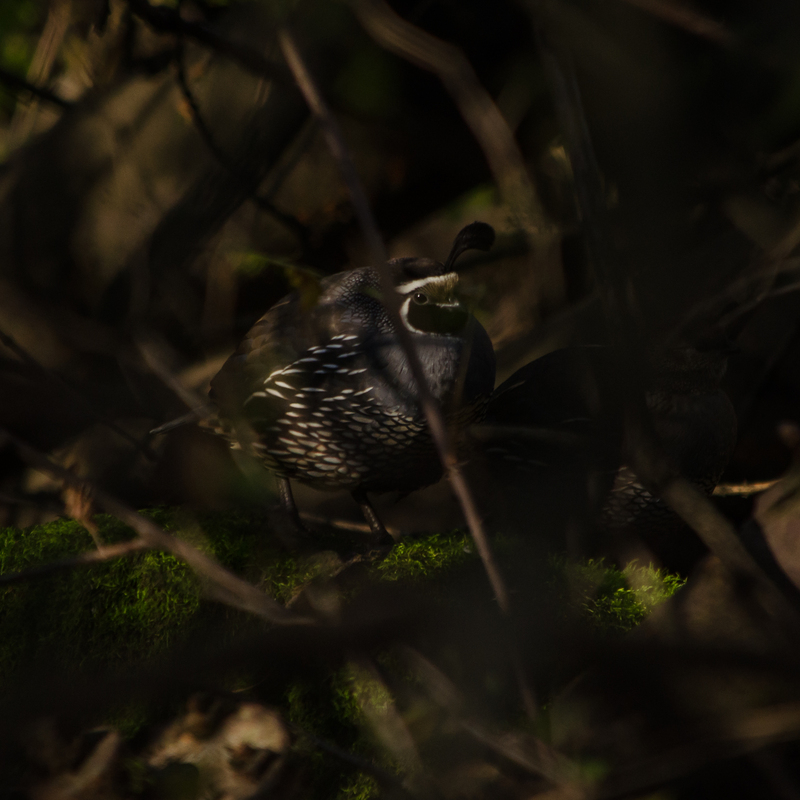 I spent twenty minutes stalking the feathered covey, as they moved back and forth in their little safe haven. I do not think my presence was much concern to them, as they moved quite close to me on their own. I just had to wait for them to enter a space where I could get my camera focused on them…my patience paid off. That makes 108 unique species photographed for 2014. 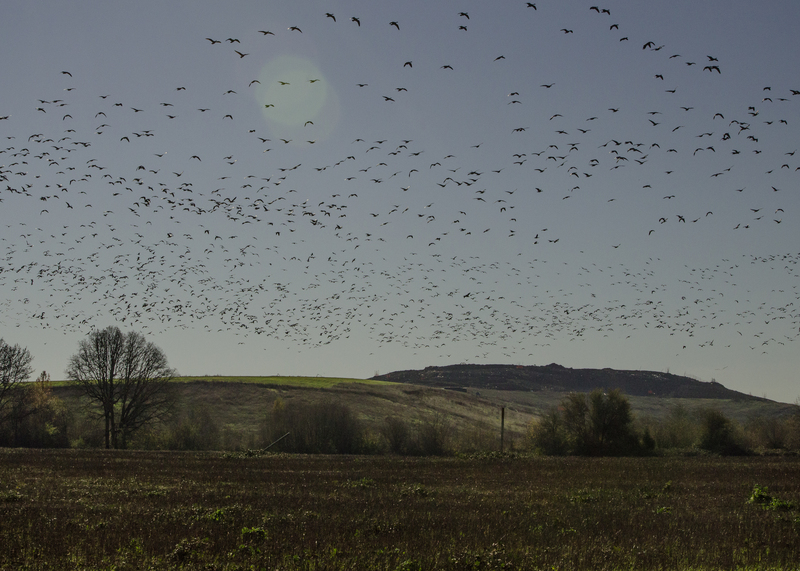 While I pursued the California quails, the fields on the other side of the trail were in constant chaos as huge numbers of cackling geese came and went. 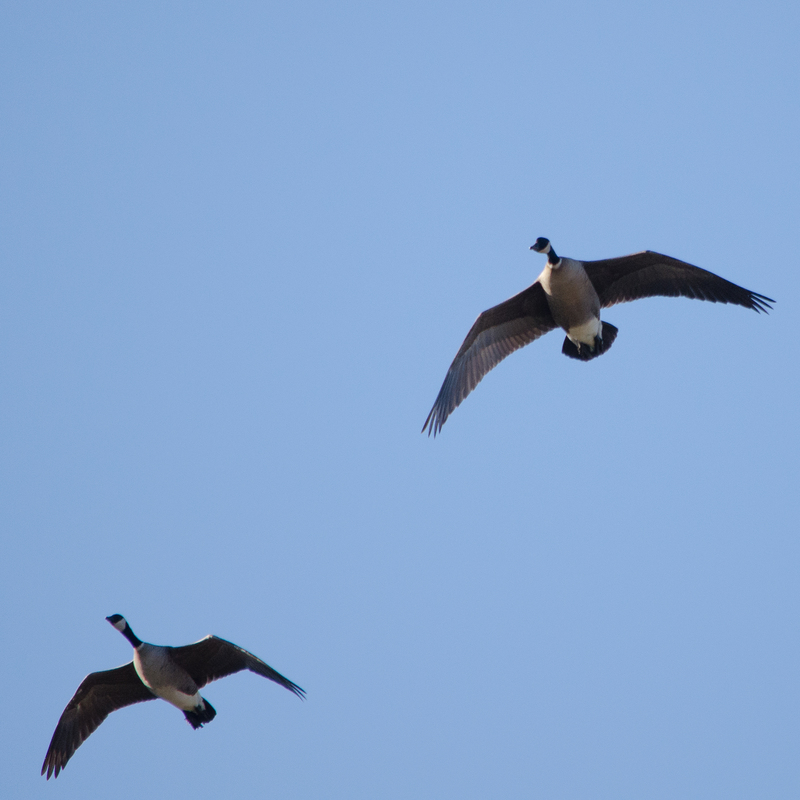 These are identifiable as Aleutian cackling geese by the white band at the base of the neck. 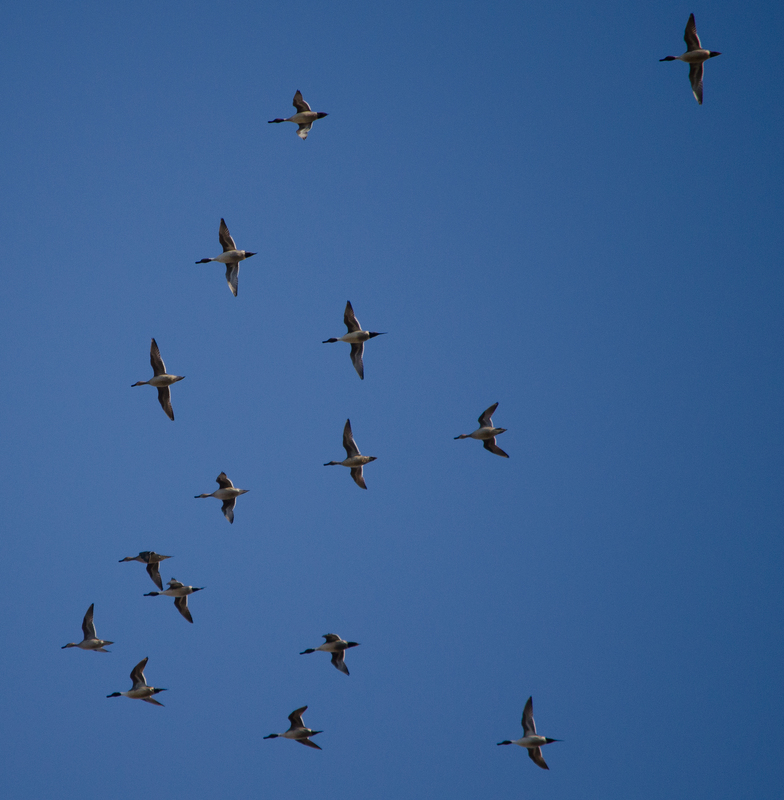 Their numbers were in the hundreds, and they were coming in from a dozen directions while others left in just as many. Trying to capture the sheer volume of the ever-fluctuating gathering was quite the challenge, but I think I was able to at least get an impression of it with my camera. 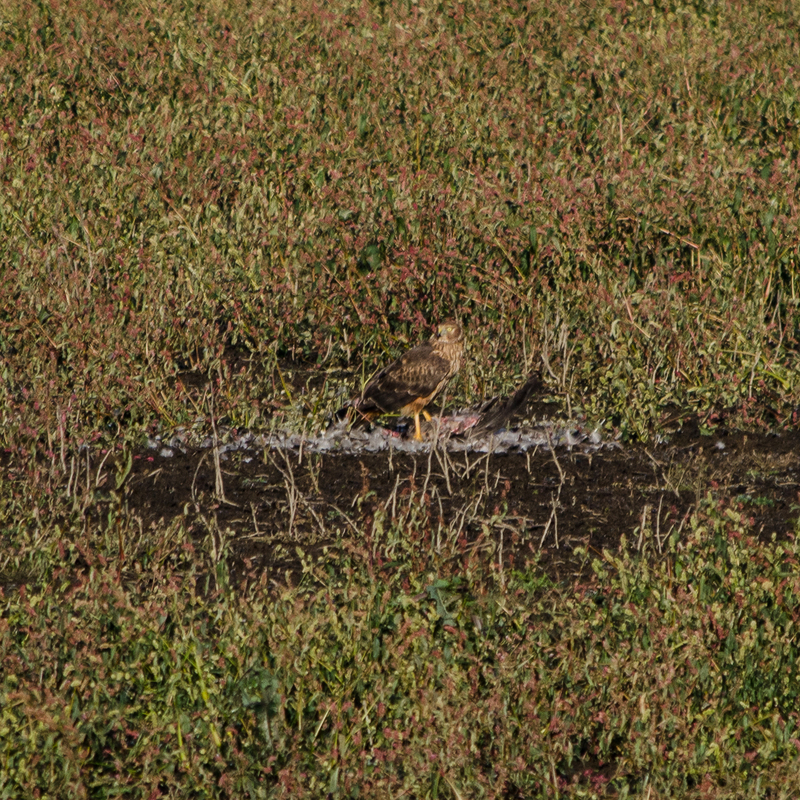 The northern harrier was not the only bird of prey drawn by such an abundance of potential targets. A bald eagle patrolled the sky the wetlands, as did a red-tailed hawk and an American kestrel. Canada geese (not just cackling geese), northern shovelers, common merganser, and great egret were seen in the wetlands. Several smaller birds are still present throughout the preserve as well. I spotted lesser goldfinch, song sparrow, western scrub jay, red-winged blackbird, European starling, golden-crowned sparrow, black-capped chickadee, red-shafted northern flicker, dark-eyed juncos, and spotted towhee. To learn find a little more information about Jackson Bottom Wetlands Preserve and other places for bird watching, including addresses and websites, check out my Birding Locations page. Be sure to visit my Flickr site for more images from my trip to Jackson Bottom this day, as well as some of my other photographs. I am enjoying your blog. Nicely done.